Sports Costs > How Much Does it Cost to Rent a Dunk Tank Cost? How Much Does it Cost to Rent a Dunk Tank Cost? 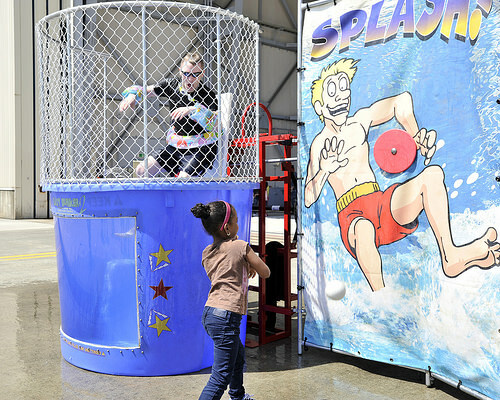 A dunk tank is a popular item seen at carnivals or parties. Made up of three basic parts, there is a large tank filled with water, usually about four feet deep and about five feet in diameter. Above this tank, there will be a chair-like structure where a person sits. From the side of the tank protrudes a metal arm with a target. When this target is hit, usually by throwing a baseball, the arm releases the chair, causing the person who is sitting in it to fall into the water. If you want to rent a dunk tank, plan on spending $150 to $500 for the day. The cost will depend on the dunk tank capacity, where you live, how long you need it for and where you rent it from. Arizona Bounce Around, a rental company based in Arizona, charges $199 per day, and this includes delivery, three dunk balls and setup. If rented, the estimates above should include the setup, breakdown, and delivery fees. It should also include the softballs to hit the target. Most companies only allow you to rent the tank for up to six hours. There are two common dunk tank options available: the fun flush dunk tank, which doesn’t actually dunk the participant in water but rather splashes them with a PVC-pipe like hose above, and a regular dunk tank, which can vary in a variety of shapes and sizes, can hold anywhere from 100 to 500 gallons of water. The targets on the side of the tank can vary in size as well, ranging from five to eight inches in diameter. Almost all dunk tanks we looked at will also come with a padded seat and step ladder for easy access. While some rental companies will deliver with their quote, some may charge an additional $1 to $2 per mile if they have to travel outside their zone. If you needed to have your dunk tank delivered to a public park, an additional permit fee may be required if your local city allows it. If you need the rental company to provide a staff member for the duration of the time being rented, then this could be an additional $20 to $35 per hour. Almost all companies require you fill the tank up with your water hose; however, if you don’t have one, it doesn’t mean you can’t rent one. Some companies can provide a professional-grade commercial hose hooked up to a water delivery truck for an additional $50 to $100. The average dunk tank takes about 30 to 60 minutes to fill with a garden hose, depending on the capacity. The maximum weight limit on most dunk tanks will be about 250 pounds, and the minimum height is five feet. A dunk tank works best on a level surface such as concrete and asphalt. While it can work on grass, the water can get dirty fast since the participants will walk in and out with wet feet. These tanks can work well in a backyard, but according to most standard sizes, your fence width has to be at least six feet wide in order to have it fit. If not, a dunk tank can’t be lifted over. Do not be afraid to haggle on the price as many companies are willing to work with your budget. Check out Groupon or other daily deal related websites to see if any local rental companies are offering any deals. If you are going to use a dunk tank more at least three times, it will probably be more cost effective to purchase one rather than rent one. While it’s not a “dunk tank,” you can purchase an alternative dunk tank for the price of a daily rental. Companies that often rent out dunk tanks have multiple other items available as well such as slides, games, cotton candy machines and more. If you were to combine other items, you may be able to receive a bundled discount.